The Mills Brothers placed over 70 hit records in the pop charts over four decades, starting from the 1930s to the late 1960s. 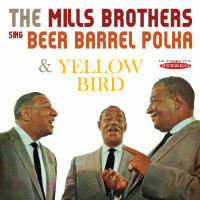 First time on CD in their entirety are the 2 albums here, THE MILLS BROTHERS SING "BEER BARREL POLKA" PLUS OTHER GOLDEN HITS, and YELLOW BIRD, which contains two hit singles, "Yellow Bird" and "Get A Job", in stereo and digitally re-mastered. Bonus tracks are cuts from the album "SAN ANTONIO ROSE".